However i cant create new C++ files. This is a blank C++ Project and when adding code to the project extending the DataTable object i am presented with this error. I'm trying to import a data table for blueprint and I'm having trouble setting it up. 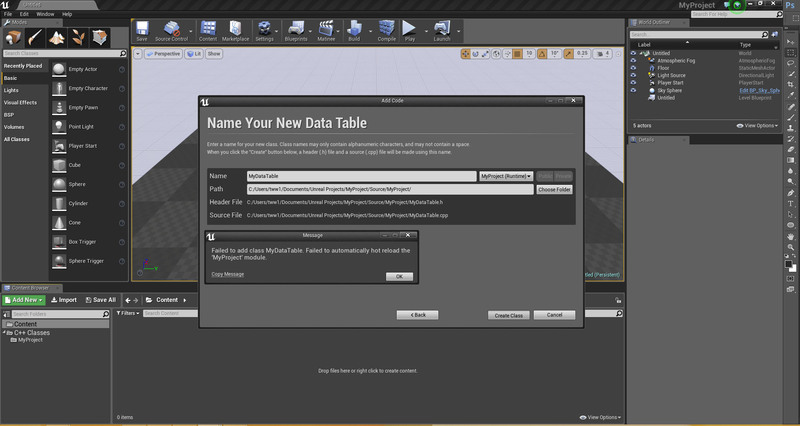 I have gone over the tutorial for it but I'm struggling with the C++ setup, i know basic code but haven't looked at C++ I'm UE4 before. I'm quite sure my problem is getting the correct parent class when adding C++ content to my project, has anyone set this up before that can point me in the correct direction. ...I'm currently working on this. Same like you , make a class out of DataTable class. Did you have any chance to get any worked sample or related link to this? Don't have to make half on C++ and half on BP. You can do it all with BP only!